I’m back to my kitchen, to my bed and most importantly to my family. Gosh! I missed my hubby and daughters. Four weeks away from home felt very long and slow. I felt the time freezing, as if the Earth was not rotating, but Thanks God, there’s a bright side for every story, because I was working with a wonderful team, on a very big brand, learning splendid recipes from a gifted chef. I came back a week ago! I miss cooking so much that we had different menu everyday for breakfast, lunch, dinner and even dessert. My family and I are overwhelmed. The first item I want to share with you after my return is Sfouf cake. 2. 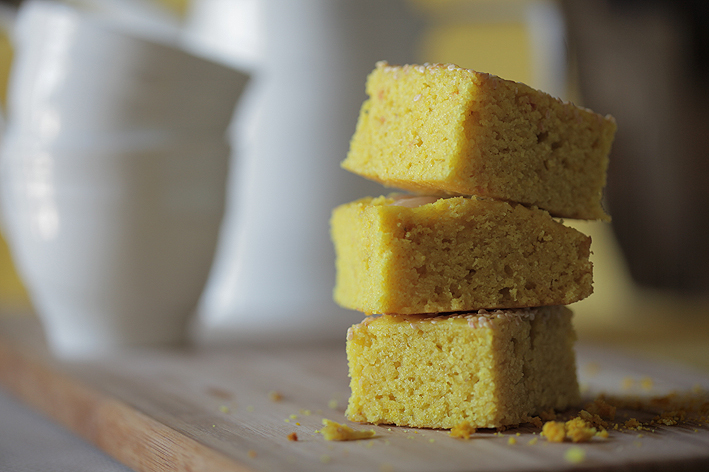 In a bowl, mix semolina, flour, turmeric, baking powder, aniseed and vanilla. Add oil and stir to make a paste. 3. In a separate bowl, melt sugar in cold milk. Add gradually to the flour and spices paste and mix using an electric cake mixer. 4. Grease the baking dish with Tahina and pour batter. Make sure it’s flat and even. Sprinkle with sesame, pine nuts or decorate with almonds. 5. Bake for approximately 30 minutes, or until golden-brown. Allow to cool for 15 minutes. Cut in pieces like you do for brownies and serve. Please note, this same recipe can be done without milk. Just dilute sugar and aniseed in water and add it to the flour and spices mixture. This entry was posted in Desserts, Recipes and tagged aniseed sweets, Cake, dessert, food photography, Food Styling, Food Stylist, lebanese desserts, lebanese food blogger, Lebanese food stylist, lebanese sfouf, lebanese sweets, Maya Oryan, middle eastern food, No milk sfouf, semolina cake, sfouf, Turmeric, yellow cake by Maya Oryan. Bookmark the permalink. Yay! I’ve never heard of sfouf… I really want to try it though. It looks lovely and delicious. Welcome back Maya! Looking forward to trying the Sfouf recipe! It looks sooo gooooood! sfouf, yay, why i am not making it anymore kids will surely love it! Maya, we miss you back here in Dubai!!! The recipe sounds easy, I will give it a try especially that I’m missing authentic home made Lebanese food these days… Can I place a request for more Lebanese recipes? stouf – sounds delish….will be trying this one today! Looks delicious! Thanks for the visit and follow on my blog!